I’ve been stuck in blogging inertia for way too long. While days and weeks have dragged and sped on, filled with lesson planning, translating, German lessons, play dates, baking, arguing, cooking, eating, guilting, laughing, interior planning, anxiety managing and too much wine & coffee drinking (plus a bit of Netflix-ing), I’ve been ignoring the little writer, cowering under the tens of thousands of thoughts that get processed in my head. ‘Write..’, it squeaks. But the thoughts of doing other things holler loudly and hold my attention longer than the little mousy writer. Being the master procrastinator can have its advantages. We’re moving out next week and I have lots of clothing and linen to wash and iron before ensconcing ourselves in a hotel opposite Alter Oper for at least a fortnight due to building delays. So instead of getting out the Persil capsules, I open up my laptop and log into my blog account after doing the obligatory Facebook browsing, article reading and ‘liking’ of the inspo memes and endearing photos. So here I am. Sorry, it’s been so long, M. The gap from the last post was a bit on the massive side but better late than… never (say never). Instagram has been a sort of surrogate blog for me for the past few months – it’s much easier to ping on a pic and write down some thoughts that accompany it, but it’s not the same as sitting down and really thinking of stringing a few decent and sometimes not so decent sentences. There’s really only so much I can type in one go on the smart phone, and now that I’m displaying carpal tunnel symptoms which get worse with phone usage (I know!) , I’m trying to minimise writing essays on it. Minimalism update: satisfied with the purging of unused, unwanted and unloved things. The move will go smoother for it, and now that we’re downsizing, it will be much more practical as far as storage goes. Working on getting the number of M’s toys down. Hard. When she looks at me with those eyes and frowns, it makes it bloody hard. But no one needs nine Barbies (all gifted!). I hate Mattel. Sanity update: pretty sane. blips mostly in the early hours but managing with meditation and mindfulness. Rate TAD program and the Headspace app. Life changers! Getting used to living in Germany update: pretty good. Language is key and now thatI can bark back at people who decide to give me lip, it’s ok 🙂 I’m using German as much as I can when out and about. Even went on a hiking trip with three German ladies and spent the majority of the time chatting in Deutsch. While this is great, it also means my English is suffering even more. This is why regular blogging would be useful for my written English. 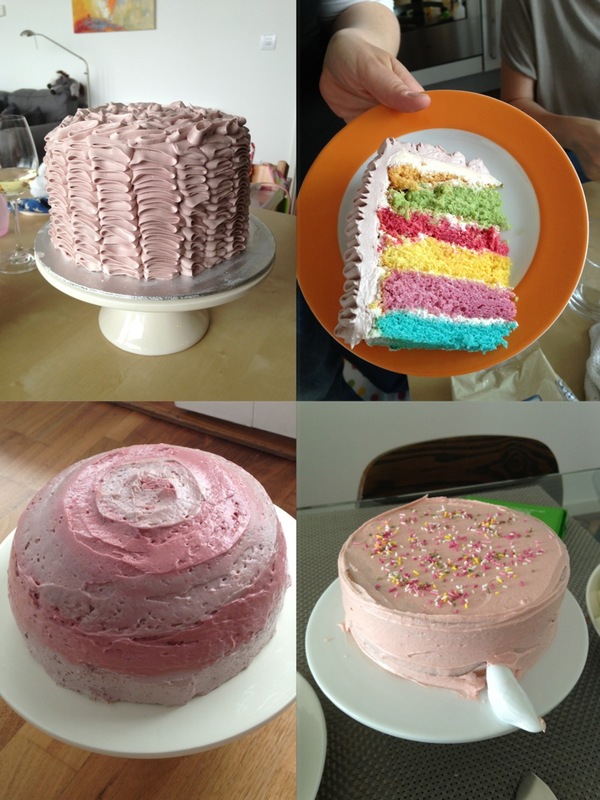 Back to blogging and baking. 4) I was a bit lazy! So, whilst my blog post compilation has not increased, my skin feels amazing (thank you Caroline!!) and I’ve realised most working mothers of young ones have stamina and will power I am not so sure I possess. They are not perfect, but bear in mind it was the first attempt at proper icing. My favourite one is the one on the bottle left. I call it the Areola cake. 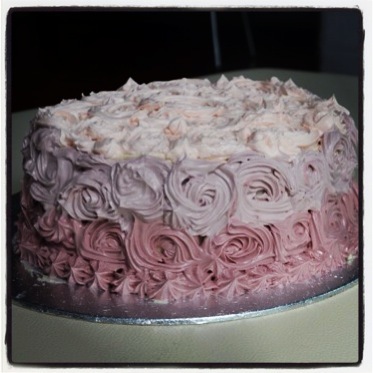 And here is a rose ombre cake I made for a local fund raising event. Hope you have had a great month!